The Arden neighborhood was part of a much larger tract of land, when it was purchased from the federal government in 1834 by James Mustard. The Pennsylvania-born farmer migrated to Indiana, seeking new opportunities for himself and his growing family. He was the father of two sons and four daughters by his first wife and five sons by his second wife, eleven children in all. The Mustards and their descendents were prominent figures in the development of Washington Township, particularly that of Broad Ripple. Following his death in 1841, James Mustard’s land was divided among his children who still resided in Washington Township, primarily to sons William, Jacob, and James. The younger James Mustard and his wife Almira (Van Scoyoc) Mustard, inherited the portion immediately north of the White River. In the first few years of the twentieth century, James and Almira Mustard gave some of that land to their daughter, Fannie Mustard, who had married Walter S. Johnson in 1893. Walter and Fannie Johnson built a home about 2,000 feet north of the White River. The house overlooked their land to the south, as well as the river beyond. 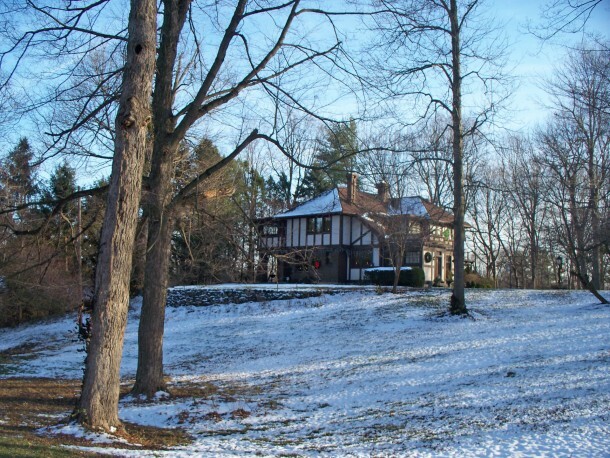 The Johnson house still stands today, on the north side of East 71st Street, immediately west of the Park Tudor School campus. However, it is not within the official boundaries of Arden. About 1910, the Johnsons sold 14 of their acres to the Van Zant family, who built a home on the south side of East 71st Street, across the road from the Johnson home. Now about 112 years old, this is the oldest home within the official boundaries of the Arden Neighborhood Association. Although the former Johnson home is older, since it is on the north side of 71st Street, it is within the boundaries of the Town of Meridian Hills). In 1922, the Van Zants divided 12 of their acres into building lots, which they called Van Zant’s Subdivision. 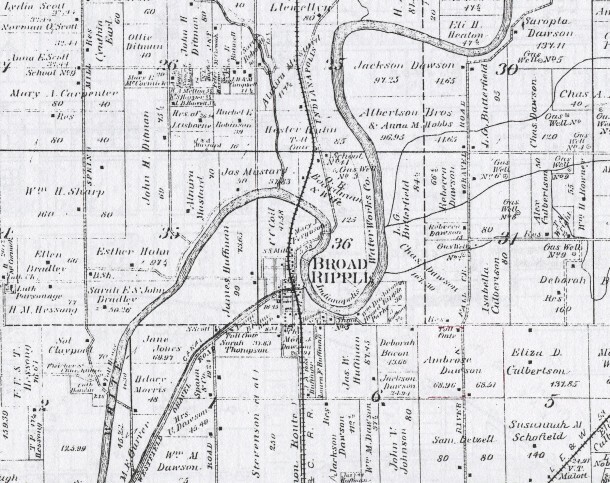 The same year, the Johnsons divided 112 of their acres into building lots and named their subdivision The Highlands of the Meridian Hills District. Unfortunately, the lots did not sell well. By the end of the decade, petitions were filed to vacate both subdivisions. 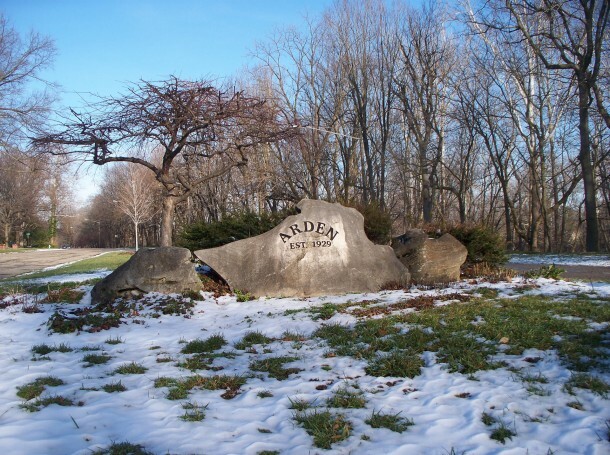 In 1929, the Arden Realty Corporation created a new subdivision of 280 lots and called it Arden. However, in the autumn of the same year, the stock market crashed, and the Great Depression began. It was nearly a decade before building really picked up again, and only a few homes were built in the new Arden Resub during the 1930s. One residence that was constructed in the Thirties was the large brick home with a slate roof high on the hill at the southwest corner of E. 70th Street and Washington Boulevard, which resembles homes found on North Meridian Street in the Butler-Tarkington and Meridian-Kessler neighborhoods. It was hoped that this impressive property would set the standard for many other grand homes to be constructed in Arden. When construction finally did resume, however, the homes were comfortable and well-built, but few were as large. Meanwhile, there was quite a bit of activity going on in the Warfleigh neighborhood, which is the neighborhood directly across the river from Arden on the south side of the White River. Warfleigh had been platted in the first decade of the 1900s, so quite a few homes had already been built in Warfleigh by the time of the country’s economic downturn, three decades later. Thanks to the Works Project Administration, two significant changes occurred in Warfleigh. One was that Meridian Street was rerouted to the east, which included the construction of a bridge over White River. Prior to that time, there was no bridge on North Meridian Street. In fact, the original Meridian Street simply ended at Riverview Drive. With the newly built section of road being called Meridian Street, the old portion was renamed Meridian Street West Drive. 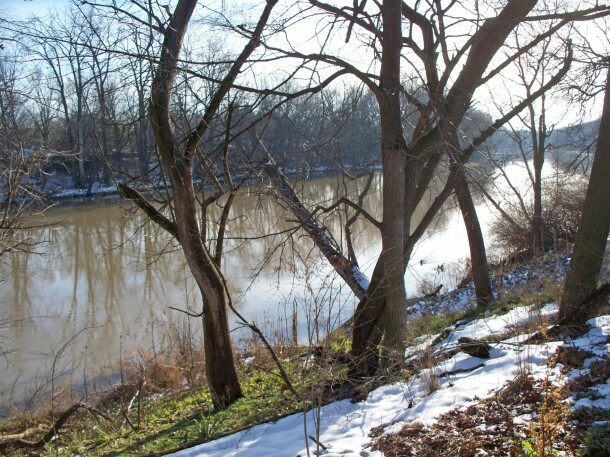 The second WPA project that would change the appearance of Warfleigh was the removal of the bathing beach on the south banks of the White River and the creation of a levee to increase flood protection. Prior to the establishment of the Warfleigh Addition, the land between the Central Canal and the White River was owned by early settler Jonas Huffman and his descendants. Dating back to the mid- and late 1800s, Huffman’s Grove had been a popular spot “out in the country” for city-dwellers to picnic or camp. It was located along what became Riverview Drive in the section between College Avenue and Washington Boulevard, once Warfleigh was developed. Apparently, people continued to use the parklike area and beach for many years after Warfleigh was built, until the levee put an end to that. 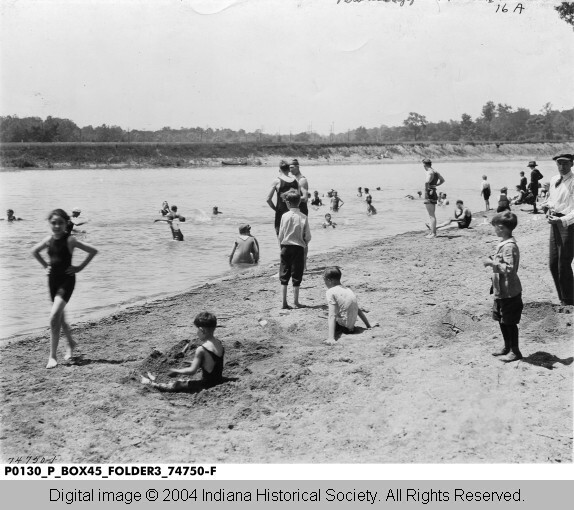 Jonas Huffman’s son, James, and his neighbor, Charles Dawson, were also involved in the creation of a bathing beach at Broad Ripple Park. The photo below is of the beach Huffman and Dawson built at the park (not the beach in Warfleigh), but it provides an idea of how the beach at the north edge of Warfleigh may have appeared. Broad Ripple Park is just a few blocks south and east of Warfleigh and Arden. With the building of the earthen levee, both the bathing beach and the unobstructed views of the river from the Warfleigh residents’ homes were removed. In recent years, a new levee project was undertaken by the U.S. Army Corps of Engineers to provide increased flood protection for the area. The Warfleigh section of the flood protection plan includes a concrete floodwall on top of the earlier earthen levee. In the 1940s and 1950s, Arden experienced a rebirth, during which time most of the homes that now exist in the neighborhood were built. Although it’s positioned between two busy north-south arteries, namely Meridian Street and College Avenue, Arden is a quiet neighborhood with little vehicle traffic and much natural beauty. Meeting Location Tonight has Changed!